RTB Real Time Bidding in Advertising is a popular discussion topic thanks to its new approach to buying and selling of ad impressions. It is the process of valuing and bidding ad impressions in real time. The process takes place during milliseconds and is highly efficient. 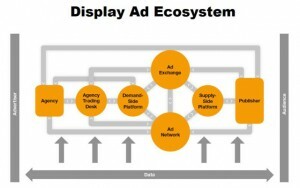 However, RTB Real Time Bidding in Advertising requires 3 components to function. This a platform that enables advertisers to purchase impressions. It is possible to buy impressions from a variety of publisher sites. Demand Side Platforms monitor this and also give an option for advertisers to customize their buying parameters. This allows advertisers to target specific users based on the information about browsing behavior or location. After, Demand Side Platforms automatically choose impression that is most relevant to advertisers. Supply side platform, also knows as sell-side platform or yield optimization platform, is a technology that enables publishers to manage the sales of their inventory and receive revenues. Supply side platform allows publishers to sell their ad impressions, whether it is mobile, video or display at the highest CMPs. Supply Side Platform provides inventory for the Real Time Bidding to take place. The major supply side platforms are DoubleClick for Publisher, AppNexus Publisher suite, OpenX, and much more. This a software that brings publishers and advertisers together. It facilitates the purchase and display of inventory. Ad Exchange is where the actual auctions take place. Through Ad Exchange publishers no longer need to connect a limited number of sites to only one network. Ad Exchange generates a great demand which, of course, results higher rates. Same is true for advertisers as now they have abundant options to choose and bid from. So, how these components run RTB? When a user opens a website, its information and details go to Supply Side Platform. After, it is sent to Ad Exchange when auction is formed. The bid information that is generated through Ad Exchange is then presented to Demand Side Platform. Based on the advertiser’s parameters and preferences, Demand Side Platform automatically decides whether the impression is relevant or not and places the bid accordingly. RTB Real Time Bidding connects the demand and supply forces and generates the most beneficial result for both sides. Also, because Real Time Bidding completely removes the need of human interactions, there is no negative impact of negotiations and transparency problems. Market forces are the only drivers. Real Time Bidding also helps advisers to avoid buying impressions that are not relevant. It enables advertisers to directly connect with their target audiences. Google DFP – What is DFP? Dynamic Allocation: How Publishers Can Benefit?